Making water filters was one of the most exciting activities in Global Water Scientists at Mountain Brook Elementary, where students exchanged messages and shared pointers with their partners in Bogota. Mrs. Andrews and her partner teacher in Bogota worked to test the technology prior to the event. They corresponded about how to best use the Level Up Village (LUV) platform to allow students to have a good experience. We were aware that the LUV platform would only allow a 10 minute window to talk live, but after consulting the LUV helpline (which we love!) they said we could easily start another session of live chat, but that we could only record the final 10 minutes.The LUV program was designed to allow the students to connect live one-on-one, but since our partner classroom did not have enough microphones to ensure that all students would have an ideal experience, we decided that the best solution was a whole-class experience. Mrs. Andrews logged into the LUV platform just before the agreed upon time. The partner classroom wasn’t there! We started to worry about the time difference. Mrs. Andrews checked her chat sessions from her previous correspondence. We opened a help chat session with LUV again, (we love that speed when in need). We racked our brains on how to help and then we just waited. The kids cheered and cheered when we finally connected. Our partner school had called in their tech support and their camera and mics were now working! The joy in our hearts as we began to share was felt on both sides of the equator. The students at each school had prepared presentations. We asked them to present first. Our students enjoyed looking for their specific partners and often waved at them. We enjoyed hearing their presentations about their country and water issues in their area and continue to be impressed with their English language skills. Next, our students presented their prepared information. They were nervous but had practiced to be ready. We shared information on our state, city, school, water issues, water filter creation process and more. As the end of the call neared, we just didn’t want to let them go. We had come to know them and be excited to share through video each week. Mrs. Andrews did a great job inviting the kids up to the mic to say goodbye and asked the other class to do so as well. I cannot express how excited our students were to “meet” their partners. It gives me goosebumps to think that half a world away those kids were focused on the exact same thing as we were. In the prior lesson, both groups of students had built water filters using the resources they had available. 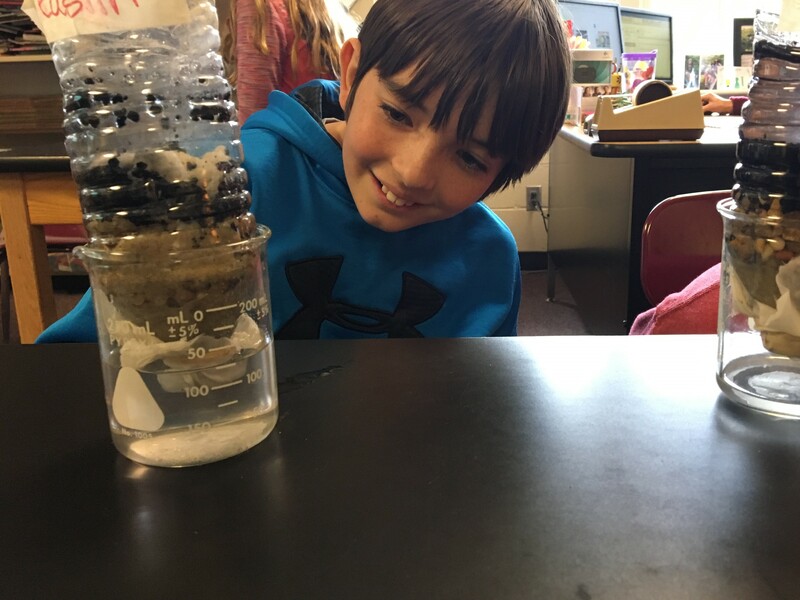 In that class, Mountainbrook students turned old empty plastic water bottles into working water filters, making good use of sand, pebbles, charcoal, cloth, cotton balls, rubber bands, coffee filters, etc. to produce their products. They made their own designs for the filters, after researching online what could work. After making their first iteration they re-evaluated as an individual and as a peer group. After adjusting their designs, they shared their findings with their LUV partner in Colombia. Students were excited to share their findings and help others adjust their designs. Mrs. Andrews helped students come before the class to share their findings and help others try to adapt their findings. At least one student did a double filtration to see if that improved results. Students were passionate about their designs and believed in their efforts and they all enjoyed sharing their work with their partners through the LUV platform. In addition to building water filters, students exchanged videos with their Colombian partners. The class was impressed with their audio and visual quality. They thought of ways to improve their own video quality on the next round of videos. Mrs. Andrews facilitated a discussion on ways they could improve and meet the challenges set by their partners and the course. In addition to our students learning, we’ve hosted various educators to see how the program works along the way. A neighboring school district and another one about an hour away sent their technology coaches and other educators, who were excited by the things they saw and hoped to see how they could incorporate these programs into their own schools. Funding is always the question. We will continue to explore options to continue this program after our year-long grant has expired. This may take some creativity and prioritizing funds on our administrators’ part. To build understanding, we’ve invited our building administrators and district administrators in to see and hear from our students. On the day of the live chat, our Superintendent and Director of Technology came to observe. The students especially enjoyed talking to both of them as they have such a passion for this type of learning. Our students speak so well about their experiences and have impressed us at every turn. Students worked diligently to create video messages for their partners in Bogota and also found quiet corners to listen to the videos they received back. If we can do this, and do it well, we want to repeat it. We need more experiences like this for our students. The experience of talking to students so far from your own experience is irreplaceable. We know on both sides, the students want to visit the others’ countries and meet face to face. The goal of the project had been met. Mrs. Andrews reflected on the project and had this to say: “The partnership with our Colombian school was amazing. I think we all learned a great deal and look forward to the possibility of continuing this type of learning. The final video exchange was so exciting and the students felt such pride as their Colombian partners spoke.” I think she and I learned just as much as the students did. We had preconceptions that we brought with us and our minds have been opened. We know our students will not forget this experience. Now we look to how to expand and fund this program for the future. Mrs. Andrews would like to see the program stay at 5th grade and expand to all the 5th grade students. She imagines that her teammates would incorporate this program into the other disciplines (writing scripts for the video recording, learning geography of the partnering school(s), cultural awareness, continue the STEM project in the science class). And I look forward to working with our next group of LUV students at the Kindergarten level when we launch a new partnership through the LUV platform in January. This will be a whole new experience for our students (and for us). Students collaborated with each other to create water aquifers. They shared what they learned with their global partner students via video message exchange. Read the entire story of Mountain Brook Elementary’s Level Up Village global collaboration, plus the students’ work with virtual reality, on the school technology blog here. Thea Patrick: Mrs. Thea Patrick is currently the Technology Coordinator for Mountain Brook Elementary, a Pre-K-6 school near Birmingham, Alabama. Previously, Thea was a teacher, Technology Coach, Instructional Technology Coordinator and Assistant Principal in Ohio. Thea is a National Board for Professional Teaching certified teacher.